Here at Cooper's Automotive we know that some vehicle repairs can occur unexpectedly and we aren't always as prepared for the expense that is involved with maintaining a safe vehicle. 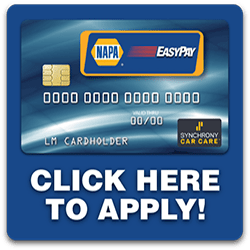 For this reason we are now offering the option for clients to finance their repairs using the NAPA EasyPay credit card. If approved, applicants will receive 6 months interest free for purchases over $199 or 12 months interest free for purchases over $750! Stop by our shop today and we can process an application instantly. If approved, we can process a money transaction TODAY!